From the Gustavus Department of Music, The Gustavus Jazz Lab Band directed by Dave Stamps, and the Adolphus Jazz Ensemble, directed by John Engebretson will perform a concert Friday, May 5. at 7:30 p.m. 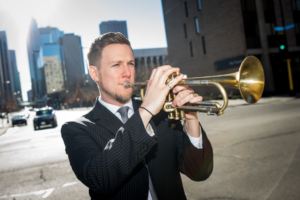 The concert will feature guest artist, Adam Meckler on trumpet. The performance will be held in Bjorling Recital Hall and is free and open to the public. Meckler’s performance is co-sponsored by Edwards Instrument Co. The Adolphus Jazz Ensemble will be presenting pieces including Wind Machine by classic jazz composer, Sammy Nestico and the classic jazz tune Sway written by Pablo Beltran Ruiz and arranged by Mark Taylor. The Gustavus Jazz Lab Band will then take the stage with pieces from Duke Ellington’s Boy Meets Horn to Adam Meckler’s composition, When the Clouds Look Like This. The Lab Band will also be featuring a number of other guest student artists and soloists from within the ensemble.